A few weeks ago Moore's Marinades & Sauces sent me a package of goodies for being awesome. No seriously, that's pretty much what it was. It made me feel amazing just to get an email from them full of kind words, the goodies were just the icing on the cake. I haven't had much time to cook lately, so they've just been sitting on the kitchen counter waiting for inspiration to strike. 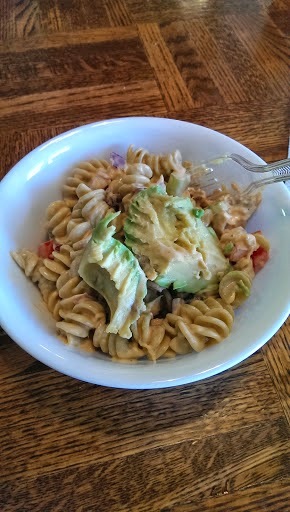 Finally it did when I got a craving for pasta salad. Pasta salads are so yummy when it's hot outside. I am glad I got that craving! We had a bag of those frozen, grilled chicken strips in the freezer; you know the kind you use for fajitas. That's where I started with this plan. I stood there analyzing what to do with said chicken and that's when it hit me, buffalo chicken. It went on until the Man Child and I came up with the following. Thaw your chicken strips. They are precooked, but you don't want them frozen. Cook pasta according to package directions. We used veggie rotini simply to get in some extra veggies. I am now hooked on the stuff. Drain pasta and rinse with cold water. 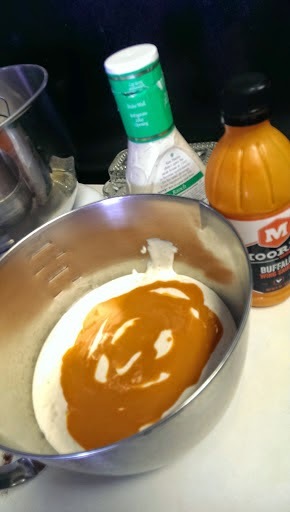 In a mixing bowl, whisk the entire bottle of ranch dressing with the desired amount of wing sauce. We used half a bottle by the time we were done. I advise to add slowly and taste often. It had a bit of a kick to it, but I probably would have used the whole bottle had Little Miss not been eating with us. The creaminess of the ranch blends nicely with the spiciness of the wing sauce. Anyway, taste and get it to your liking. 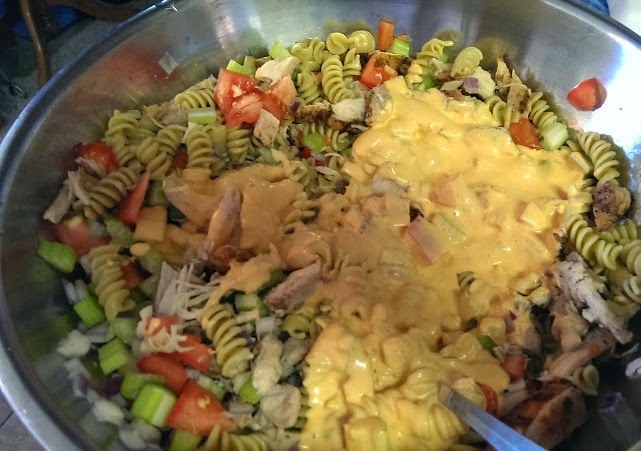 At this point mix the pasta, sauce/dressing mixture, and chicken in a large mixing bowl. Then add the onion, tomatoes, and celery and blend thoroughly. This is one of those recipes you can be creative with. I used red onion because I love them, tomatoes because I was craving them, and celery because it goes with buffalo chicken like peas go with carrots. You can pretty much do what you want to here. Things that might make nice additions are bacon, blue cheese crumbles, maybe some diced garlic... be creative! The Man Child and I topped our servings with sliced avocado and it was to die for. You can serve it warm or cold. Personally I think it was amazing the next day as lunch cold. The flavors had melded together into perfection. Be warned, this makes a lot. 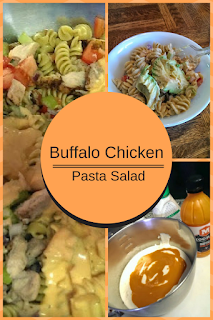 I can't tell you how many servings it makes but it fed three very hungry people the night we made it then filled up 3/4ths of a gallon size freezer bag when we put the leftovers in the fridge. It would be great at a BBQ, potluck, or picnic. It was a simple week night meal that packed a flavorful punch. I will definitely be making this again!